Savoy's fifth studio album "Savoy" was released in Norway on 30th August 2004 on the record label "Eleventeen Records". The album was available in two different versions; a regular version and a limited edition digipak (3000 copies) which comes with a bonus DVD. The bonus DVD includes a short film around the song Isotope. The cover of the album is light brown with old fashion style borders and the Savoy logo printed in large letters across the middle. In addition there are some flower designs in the bottom corners and flying birds at the top. 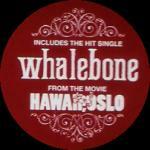 A red and white sticker can be found on the outside wrapping of some copies of the CD, it reads "includes the hit single Whalebone from the movie Hawaii Oslo + bonus DVD". The reverse of the digi-pak is of similar design to the front cover with the track list printed down the middle. Inside the digi-pak are some pictures taken from the Isotope film found on the DVD, a larger drawing of one of the flower patterns from the front sleeve and a patterned strip. The CD itself is dark grey with a matt finish. The Savoy logo is printed across the top of the disc with a small flying bird at the bottom. The DVD disc is white with the Savoy logo across the top and a flower pattern down each side of the disc. The back cover of the regular edition is similar to the inside cover of the digi-pak with the flower drawing and pattern strip on the right hand side and the track list on the left. All songs were written by Waaktaar-Savoy. All tracks except 1, 4, 5 and 9 were produced by Savoy, the others were produced by Savoy and Frode Jacobsen. The album was mixed by John Agnello (Tracks 1, 2, 6 & 8), Rod Hui (Tracks 3, 7 & 10), Michael Brauer (Track 4 & 9), Michael Ilbert (Track 11), Head (Track 12). "Savoy" was recorded and edited by George Tanderø, Mike Hartung, Rod Hui, and Paul and was mastered by Vlado Meller at Sony Studios, NYC. The album features Paul Waaktaar-Savoy on lead vocal, guitar, keyboards and percussion; Lauren Waaktaar-Savoy on lead vocal and Frode Unneland on vocals and drums. Other musicians featured on this album include: Jimmy Gnecco (vocals - Tracks 5 & 11), Geir Sundstøl (pedal steel - Track 4 & 9), Sølvguttene Boys Choir (vocals - Track 5), Jørun Bøgeberg (bass - Tracks 5, 6 & 11), Hågen Rørmark (harmonica - Track 8), Robert Burås (wild guitar - Track 9), Per Lindvall (drum fills - Track 11), James and Timothy Roven (strings - Track 11). There are some 12-track CD-R album samplers in circulation.